Photo by Bryan Stevens A young Chestnut-sided Warbler conceals itself in a holly tree. The following are all Facebook posts about my annual lawn chair birding experiences. My mom and I have made lawn chair birding an annual tradition every fall. It’s a great way to enjoy the warblers and other migrants that stream through the yard in late August, September and October. For the most part, you can even avoid the neck sprain that comes with long period of scanning the treetops for glimpses of energetic and evasive warblers. Photo by Bryan Stevens A young American Redstart selects a perch. It’s been almost three months since I added a new species to my 2015 yard list. I had last added Chimney Swift back on May 29 and Yellow-billed Cuckoo on June 2. This evening I added White-eyed Vireo as Bird No. 60 for the year. I also saw a pair of Indigo Buntings, two Black-throated Green Warblers, three Blue-gray Gnatcatchers and several Ruby-throated Hummingbirds. I think fall migration must be underway. 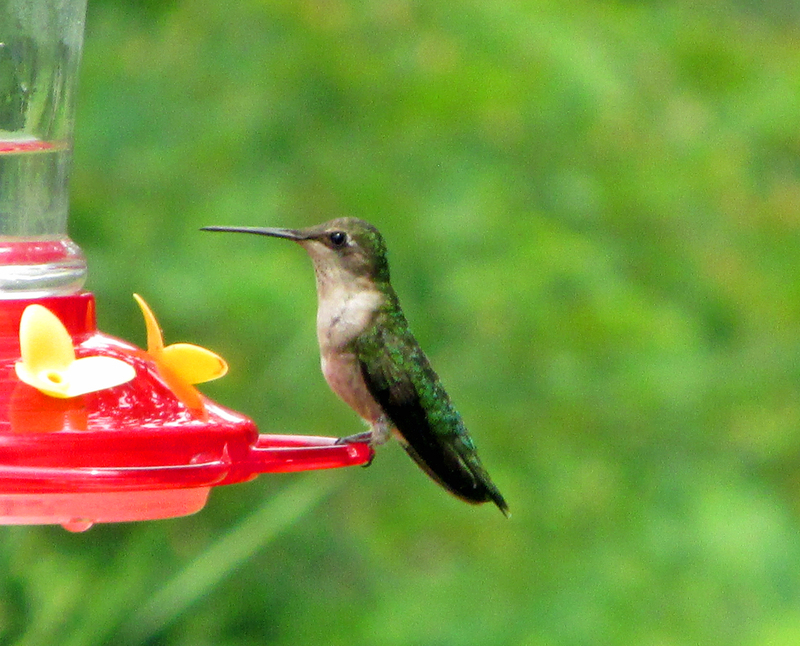 Photo by Bryan Stevens A Ruby-throated Hummingbird perches on a feeder. Two new birds for the yard list made appearances today. I have heard a Common Raven calling several times today. Around 7 p.m. my mom called and alerted me to a flock of Wild Turkeys (two adults and eight young birds) in the field. The raven and turkeys are No. 62 and No. 63, respectively, on the list for Yard Birds in 2015. The first fall warbler — a young American redstart — showed up this evening, and it’s also a new bird for my 2015 Yard List. The redstart is No. 64 for the year. I also saw Blue-gray Gnatcatcher, Chimney Swifts and Ruby-throated Hummingbirds. Photo by Jean Potter A Tennessee Warbler makes a fall migration stop. Just got in from lawn chair birding with my mom. 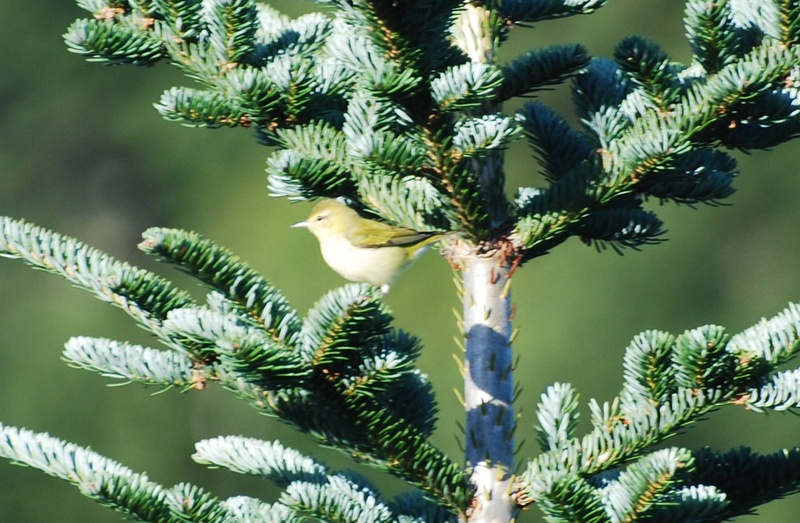 We enjoyed several warbler sightings, including some new yard birds for 2015. A gorgeous male Canada Warbler treated us to some great views and became Bird No. 65 in the yard this year. Three young Chestnut-sided Warblers will represent Bird No. 66. 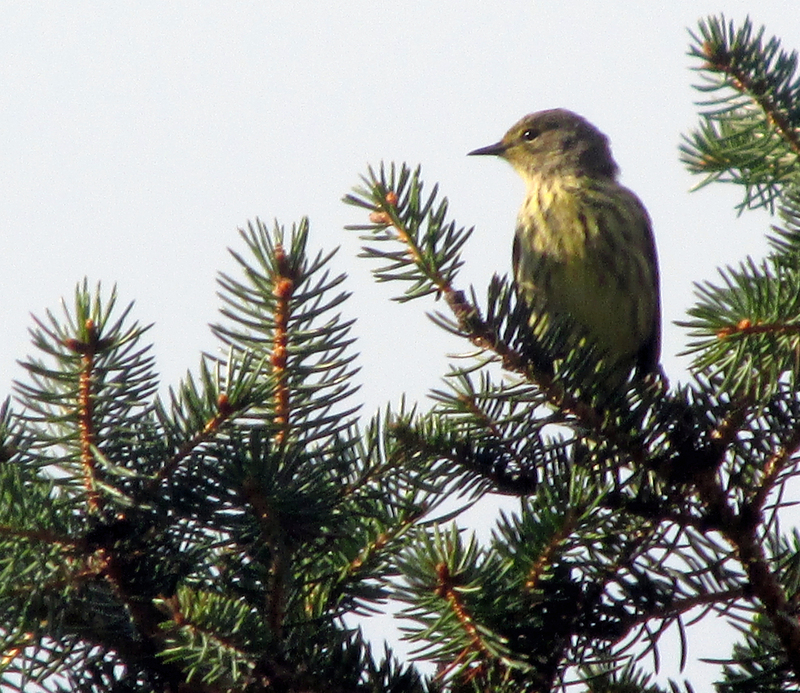 Finally, a Cape May Warbler is Bird No. 67 for the yard this year. We also saw Black-throated Green Warblers, American Redstarts, Red-eyed Vireos, Ruby-throated Hummingbirds, Blue-gray Gnatcatchers and an Eastern Phoebe. 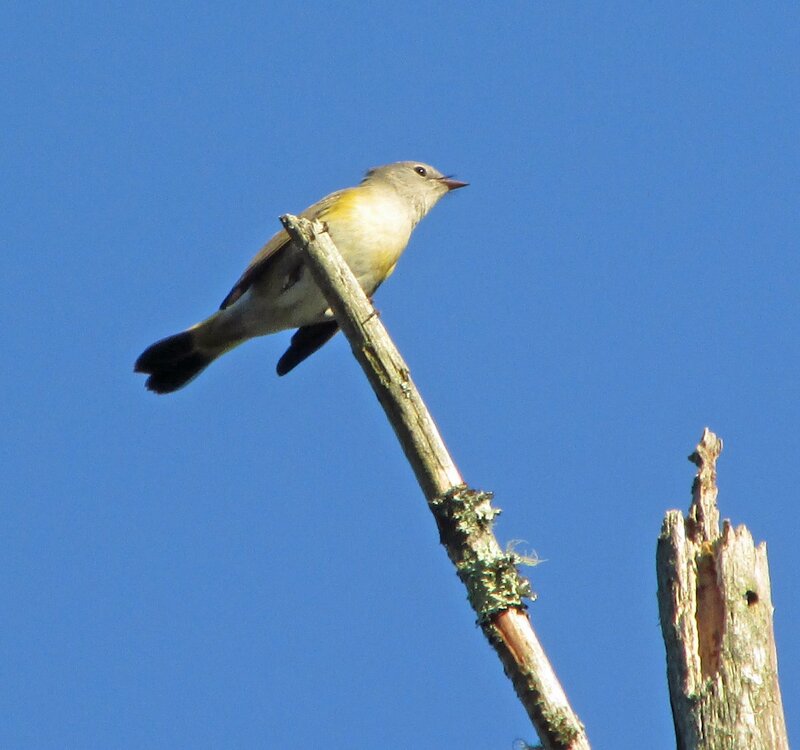 I managed photos of the Cape May and the American Redstart. 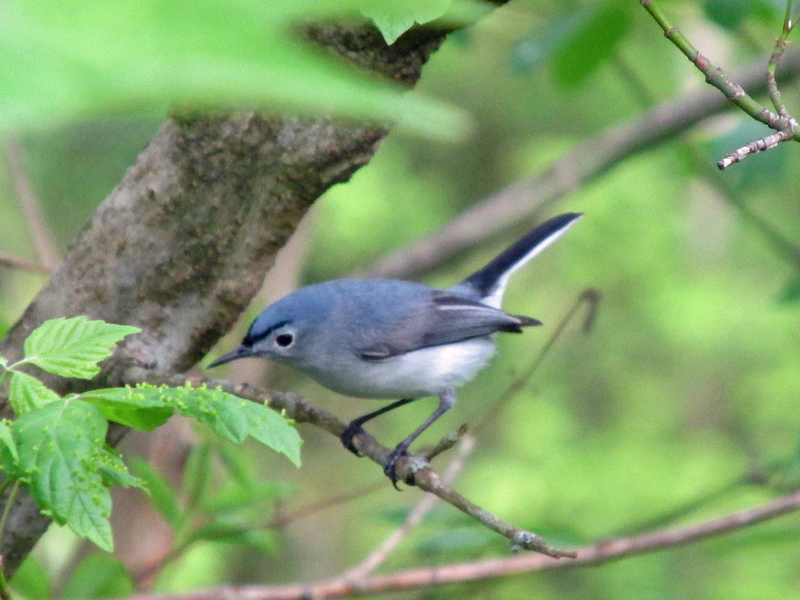 Photo by Bryan Stevens Blue-gray Gnatcatchers are common during fall migration. I’m closing in on 70 yard birds for the year. This evening, while lawn chair birding with my mom, I added two more new ones. The Magnolia Warbler was Bird No. 68, while the Eastern Wood-Pewee was Bird No. 69 for 2015. I didn’t get photos of the new birds, but I did photograph a young Chestnut-sided Warbler, a young Ruby-throated Hummingbird and a Chipping Sparrow. Photo by Bryan Stevens A Cape May Warbler perches in a spruce tree. No new yard birds this evening, but lawn chair birding with mom wasn’t entirely uneventful. We got a look at a Scarlet Tanager, saw several hummingbirds, including an adult male, and Blue-gray Gnatcatchers. 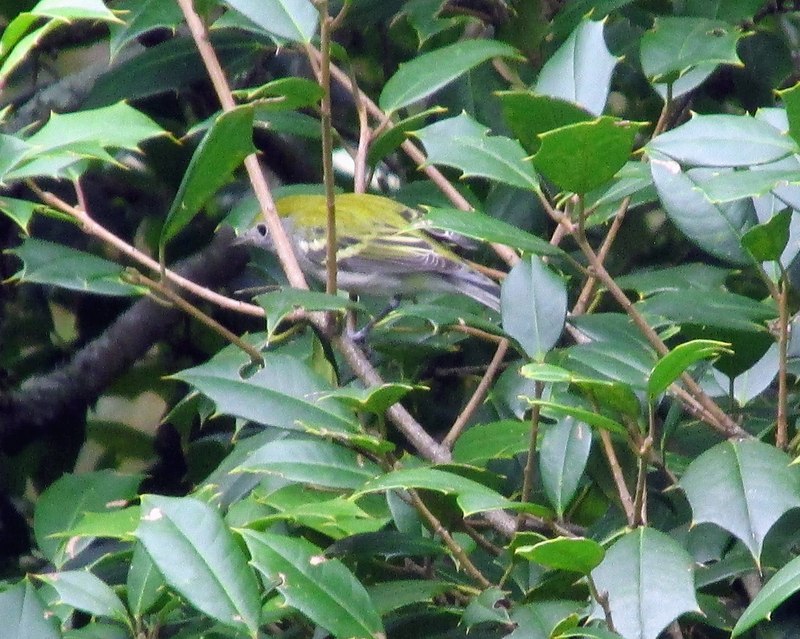 Earlier today, mom said she spotted a yellowish warbler but the bird didn’t make a second appearance. Lawn chair birding today has produced three new birds for the 2015 yard list. They’re all warblers! Bird No. 70 for the year is a Blackburnian Warbler. Bird No. 71 was a Tennessee Warbler, while Bird No. 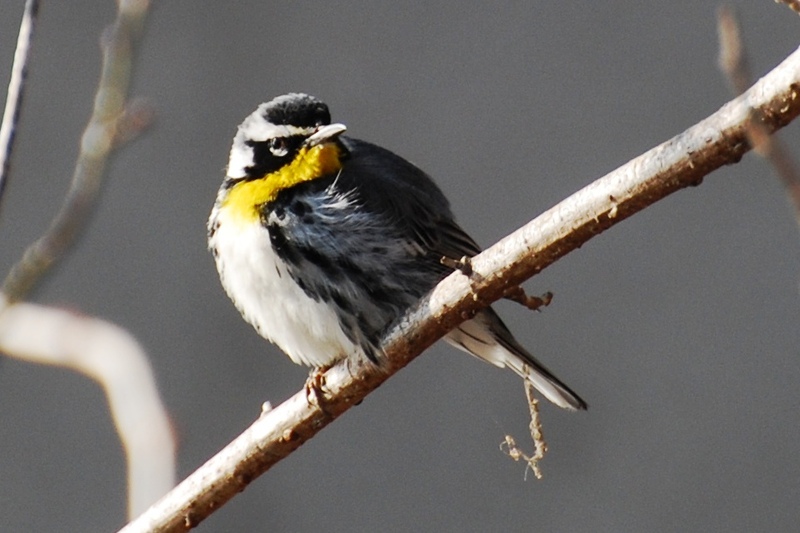 72 was an impressive Yellow-throated Warbler. Evening’s still young, so may be some others show up. I also saw a Scarlet Tanager, Ruby-throated Hummingbirds and a Red-eyed Vireo. Photo by Jean Potter A Yellow-throated Warbler sits on a twig perch. This entry was posted in Birding, Birds, Fall migration, Uncategorized and tagged Birding, birds, Bristol Herald Courier, Carter County Compass, Elizabethton Star, Erwin Record, Feathered Friends, McDowell News, Our Fine Feathered Friends, The Erwin Record, warblers on September 6, 2015 by Bryan Stevens.